Gruppo Bertone, commonly known simply as Bertone, was an Italian automobile company, which specialized in car styling, coachbuilding and manufacturing. Bertone styling is distinctive, with most cars having a strong "family resemblance" even if they are badged by different manufacturers. Bertone has styled cars for Abarth, Alfa Romeo, Aston Martin, Citroën, Ferrari,Fiat, Iso Rivolta, Lancia, Lamborghini, Mercedes Benz, Opel and Volvo Cars, among others. In addition, the Bertone studio was responsible for two of the later designs of the Lambretta motorscooter. In the late 1980s, Bertone styled the K20 motorcycle helmet for Swiss bicycle and motorcycle helmet manufacturer Kiwi. On 26 February 1997, on the evening of the Geneva Motor Show, Nuccio Bertone died, leaving the world to grieve "one of the greatest coachbuilders of the century, and international Maestro of Italian style" in the touching words of Fulvio Cinti, motoring journalist and car historian. In 2009, the Grugliasco plant, along with its manufacturing activities, was taken over by FIAT. Bertone underwent a major restructuring and became a fully integrated service company in the automotive, transportation and industrial design sectors. Bertone's major competitive advantage is the unique ability to respond in a flexible and extremely fast way to the demand and needs of its customers. 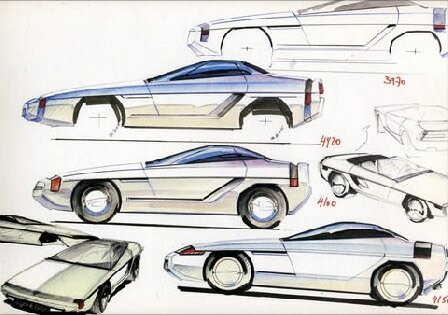 Bertone has a workforce of roughly 300, mainly engineers and designers, 300,000 engineering hours per year capacity, can manage up to four prototype projects per year, starting with the first style drafts to the effective manufacturing of the prototype. The Bertone "Atelier" continues its traditional work in designing and manufacturing one of a kind cars, upon customers specific requests. March 18th 2014, after having ceased trading because of financial difficulties, Bertone confirmed that it will be declared bankrupt if a suitable buyer isn't found by the end of April. Follow The Cortile's board Carrozzeria Bertone on Pinterest.